Frampton is undefeated in 21 pro fights and says tonight's fight will be "so one-sided it won't warrant a rematch"
Carl Frampton says he will beat Scott Quigg so comprehensively on Saturday that there will be no reason for a rematch. Belfast's Frampton will put his IBF super-bantamweight title on the line against Bury's Quigg, the WBA champion, in front of 20,000 fans at the Manchester Arena. 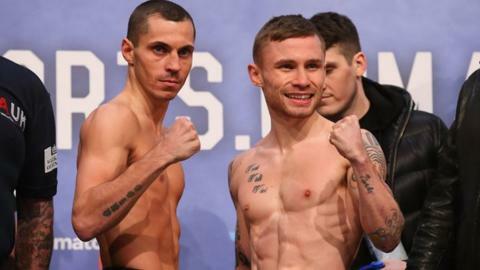 In reply to Frampton, Quigg vowed to upset the odds and knock his rival out. "It will be so one-sided it won't warrant a rematch," said Frampton, 29. "People are comparing it to Marco Antonio Barrera and Erik Morales [the Mexican greats fought a classic trilogy in and around the super-bantamweight division in the 2000s] because they were so closely matched. "But I don't see this fight like that. Once he gets hit he will go into his shell and I'll outbox him, until he gets brave enough to open up. When he does open up, he'll get knocked out. "If he stays tight and keeps his hands to his chin, it may go the distance. If it does, it's a comprehensive points win for me. Either way, it will be such a comprehensive win for me that they won't want a rematch." Quigg, 27, responded: "He'll stay calm for a while, but sooner or later he'll take the bait and I'll take him out. "I've got to go in there and be smart and composed. That's the key to this fight - composure. Whatever he brings on the night, I'll have an answer for. "I'm a terrible loser. If I lose at Connect Four I'll be banging the table and smashing the pieces. "You show me a good loser and they'll be a born loser. Good losers aren't right in the head." Frampton-Quigg is one of the most eagerly anticipated domestic match-ups in recent memory, and the first time two undefeated British boxers have fought to unify a world title. Frampton, who is undefeated in 21 pro fights and managed by boxing legend Barry McGuigan, is a slight favourite with the bookmakers. However, the fact that Frampton was knocked down twice in his last fight against unheralded Mexican Alejandro Gonzalez, along with Quigg's demolition of the tough Kiko Martinez, suggests it could go either way. Quigg, who will have Ring magazine's trainer of the year Joe Gallagher in his corner, is undefeated in 33 pro fights.